KBW Boxing Gym held their 10th amateur show in Dewsbury last weekend which saw Commonwealth bronze medallist Haroon Khan and former WBC welterweight World Champion Junior Witter hand out trophies on an entertaining evening. The KBW gym hosted another sell-out boxing show at the Orchid banqueting suite in Dewsbury last Saturday. It was KBW’s 10th boxing show in the area with over 10 bouts taking place, many of which saw home fighters up against opponents from clubs from further afield. The KBW shows have become increasingly popular in the amateur boxing circuit with larger turnouts, which include celebrities from the boxing world, who are impressed with quality displays produced. Lewis Benson joined KBW a year ago and faced his third skills bout. Although no winner is declared in skills bouts, Benson dominated his opponent over all three rounds. KBW’s Uzair Kiani produced a neat display of footwork and fast hands in a very enjoyable skills bout contest. At the end of the bout, the referee raised both hands declaring no winner but both boxers picked up valuable ring experience. 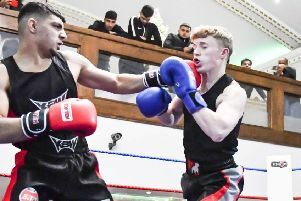 KBW’s Harkaran Singh was involved in his first skills bout but showed excellent ability, boxing on the front foot for all three rounds in a convincing display. Fizan Khan (KBW) lost by unanimous decision to Shaquille Martins from the Oliver’s Gym but home fighter Corey Rylah was again in form, dominating his opponent to secure a unanimous decision against Tom Collingwood of the Ingles Boxing Academy. Asim Arshad from the Bolton Champions Boxing Club won a split decision over Subhaan Mahmood of the Ingles Academy, while Adam Yafai (Ingles) won a split decision over Alan Hasan (Longsight Boxing Club). The two main bouts of the night proved a worthwhile wait, as they produced hugely entertaining contests. In the joint main event, Huzaifa Khan faced James Jacques from the Love Boxing Academy. Jacques had recently boxed in Sweden, winning a gold medal, and was the more experienced boxer but it was the KBW man who got off to an aggressive start from the first bell. Jacques had the height and reach advantage, forcing Khan to get in close and land his shots but the home man’s power caused Jacques problems throughout the first round. Jacques attempted to rally in the second round but was checked by Khan, who produced devastating body shots. As Jacques attempted to cover up, Khan targeted the head as he continued to dominate. Khan landed a heavy uppercut, which brought a standing eight count, as he almost forced a stoppage in the final session. Jacques rallied courageously to hear the final bell but it was Khan who deservedly had his hands raised as the victor by unanimous decision. In the final bout, KBW’s Saif Cheema faced Mark Bebington of the New Era Boxing Academy. Cheema stands at 6ft 2in but had the rarity of facing an opponent taller than himself and knew he was in for a tricky fight. Cheema’s height and reach is usually one of his advantages but the KBW man was forced to change his normal boxing style. Both men seemed content to box on the back foot and counter attack in the first round but eventually Cheema’s hand speed caused problems, while he also used good footwork to stay out of the way of Bebington’s dangerous big shots. Cheema took the first round and then used ring craft and a cool head. Bebington tried to force the pace but Cheema refused to engage in a brawl against the physical superiority his opponent possessed and the KBW man secured victory by a unanimous decision. Professional boxers Atif Shafique, from the Ingles camp, and Haroon Khan, younger brother of Amir, were joined by former WBC welterweight World Champion Junior Witter, as they handout trophies and posed for pictures with the young boxers. Asian singer ‘Nafees’ provided further entertainment to the crowd on a thoroughly enjoyable evening, while the event also raised a substantial amount of money to provide winter aid for refugees stranded in Greece.